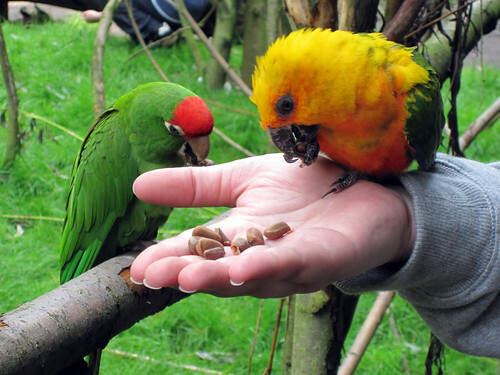 Seeing the birds at the parrot park was a joy, as was giving the friendly feathered friends treats from our hands. As we followed the suggested route through the park, we came upon my favorite aviary of all – the one that we could go inside! 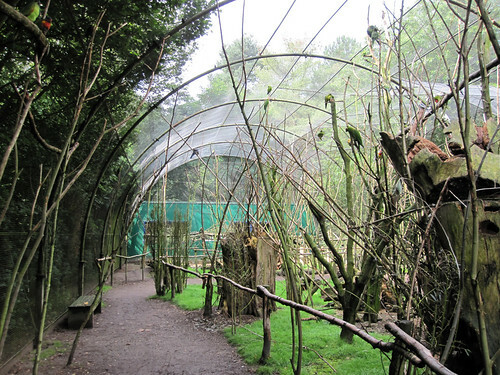 Several different species were housed in the aviary open to visitors. The birds came to us, if they wished. There were plenty of perches where the birds could retreat if they didn’t want to visit with the papegaairazzi (zing!). Please forgive (or enjoy!) 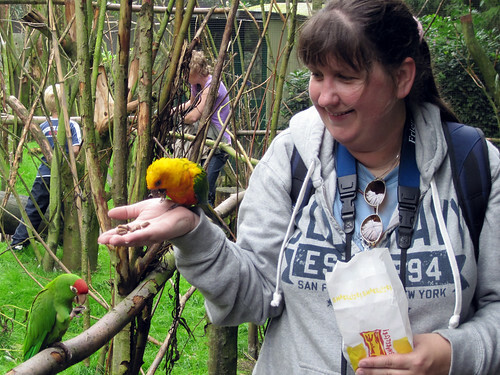 this series of gratuitous me-feeding-parrots pictures. The short video shows a Cockatiel on my shoulder. It looks like I’m encouraging her to kiss me, but she started it, honestly!! 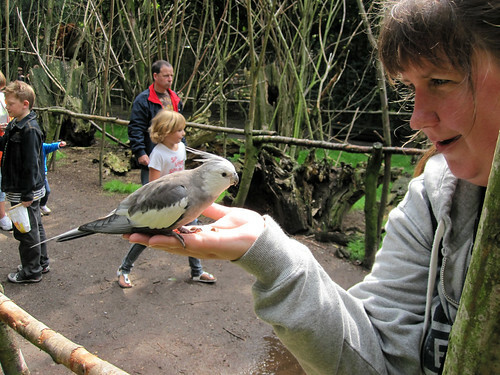 You can imagine this was a really special experience for me, and I loved meeting all of the birds up close and personal. Unfortunately, the pet trade is no friend to parrot species in general, and so almost everywhere you look in the park, there are signs like this one. 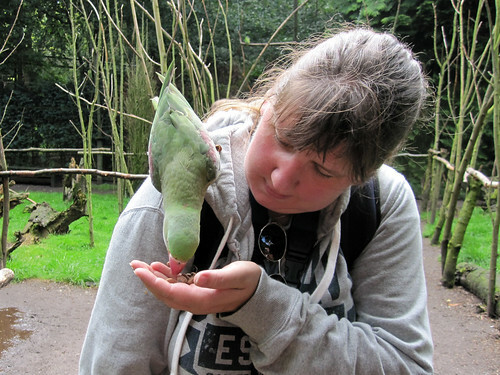 This post concludes Parrot Week on the blog. 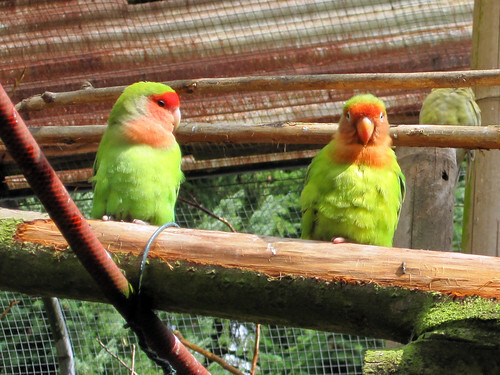 I’ll have one final post on the Papegaaienpark Veldhoven next week – because there are more than parrots at the park! 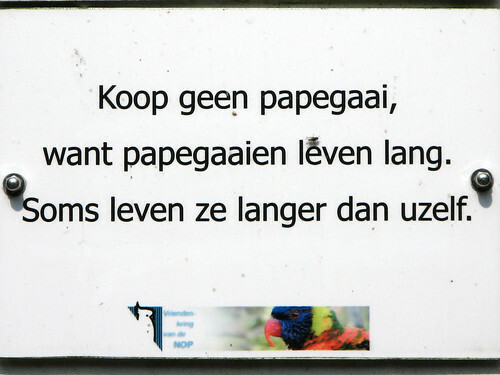 This entry was posted in Netherlands, Parrot Week. Bookmark the permalink.